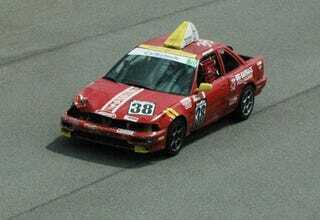 After a frustrating second place finish due to mechanical problems on Saturday, Krider Racing came back with vengeance and won the Sunday ChumpCar enduro by six laps in their Big Sausage Pizza Delivery machine. Krider Racing had recently been stuck in a slump of numerous second place finishes (including their epic last lap roll-over at Buttonwillow). It was beginning to look like they may never see a first place again. That all changed today when some racing luck came their way and all the pieces fell perfectly in place for their return trip to victory lane. For their weekend effort the team picked up a gnarly looking skull trophy and $1,350 in prize money. The ChumpCar L.A. Freeway Enduro held at Auto Club Speedway in Southern California had some great racing and plenty of mechanical drama with $500 race cars. Grabbing second spot, six laps down on Sunday was team Zoom Zoom Boom. The team said toward the end of the race they were trying to drop nails on the track in front of the Krider Racing Integra to even things up a bit. The Cheetors in a Nissan SE-R armed with a two foot orange Cheeto on the roof picked up the final podium spot on Sunday. Their finish was very impressive since they started the race with an empty gas tank and had to pit for fuel after two laps. Note to self: 1. Fill car with gas. 2. Then go race. The Mini picked up a ChumpCar award for doing three, yes you read that correctly, three motor swaps that weekend. It was impressive that they pulled off three swaps, but even more impressive that they actually found three mini engines that ran. Well, they ran for a little bit anyway.